Nevertheless, a pair of new reports suggest that Apple's ambitions behind its investment in the Uber rival could relate to its oft-rumored electric vehicle plans and broader push into the automotive industry. The Wall Street Journal wrote that Didi Chuxing is "not only an important ally in a key market, but also a rich data source for self-driving vehicles," which is valuable to Apple amid rumors that it is developing its own electric and possibly autonomous vehicle. Didi provides Apple with a rich data source for its self-driving vehicle push. It also could provide benefits to Apple’s mobile ecosystem. Ride-sharing apps are closely linked to payment services, such as Apple Pay. They also can be the foundation for other mobile commerce transactions such as deliveries. The investment sets up with a potential showdown of firms aligned with Uber, which has taken investments from Alphabet Inc.’s venture capital arm and Chinese search giant Baidu. Both Alphabet and Baidu have invested heavily in autonomous driving technology. 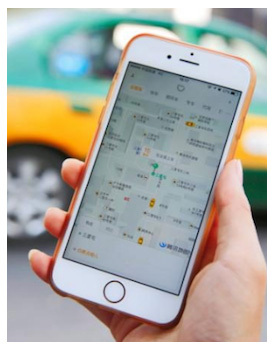 The Information reported that ride-sharing services like Didi Chuxing and Uber are highly interested in self-driving vehicles, which would reduce overhead costs by eliminating the need for contracted drivers. In fact, Uber CEO Travis Kalanick was reportedly planning to meet at Apple headquarters this week to "talk about future partnership opportunities," but the status of that meeting remains unknown. This deal isn’t about the Didi service today. It establishes a future alliance around tech like self-driving cars, where Apple and Google are going head-to-head. Developing autonomous vehicles is the end game for these ride sharing companies—the move that will help them mint money by cutting out the cost of drivers. Uber has made big investments on that front, as has its partner Baidu. Didi had not. But Apple […] can help. The so-called Apple Car, allegedly known as Project Titan internally, could launch by 2020. The bulk of research and development may be centered in the Santa Clara Valley area, near Apple's existing Cupertino headquarters, led by a team that includes former Tesla, Ford, and GM employees and other automotive experts. The vehicle is expected to compete with the likes of Tesla and Google. Remember after Steve was fired from Apple, they started dabbling into really weird niche products that had nothing to do with their core business and sales across the board began to tank due to lack of updates/innovation in the products that actually made money thus crippling the company revenue? I look at the numbers for iPhones and Mac's going down year over year, stories like this one indicating more and more capital and resources being diverted from core product R&D into this "Apple Car," and I can't help but get a chilling sense of deja vu. Does it make it even worse that Tim Cook is trying to align and integrate the company on a substantial level with a communist government with a terrible human rights record? Seems to me that Tim Cook has taken for granted the market that has turned the company into what it has become, the United States, because he feels beholden to the market to keep searching for higher and higher returns. But instead of focusing on innovation through the pipeline, and continuing to focus on what has made Apple great, he's been looking for short term solutions by focusing so heavily on emerging markets. And I'm not saying that trying to capitalize on countries like China and India should not be a focus, but to do so in a way that I feel is detrimental to the long term interests of the company is short sighted and could be a costly mistake. If US consumers start to feel that Apple is prioritizing Chineze business over America interests because it is a "bigger" market with more growth potential, then they are going to start looking elsewhere. And if US consumers start to go elsewhere, then the shine of Apple begins to wear off and it could be crippling on its business worldwide. Now, obviously a worst case scenario, but I don't like the direction Cook is taking the company, and haven't for a while now (see fashion wearables, multiple color computers, low power computers, increasing share buybacks, etc.). A little worrisome. So what do you think Apple should be working on for the future? Smartphones and laptops are pretty mature at this point. I don't think autonomous vehicles are weird or niche. Not part of Apple's core business now but their core business is pretty mature with not a ton of growth prospects. if all Apple can ever be is a company that makes phones and laptops/desktops then I don't think the future is very bright. People said that about the iPhone. There were computers and there were phones -- and the two worlds were entirely separate. Not a core business at all. Apple is a company that is really good at using industrial design + engineering to create consumer products. They are trying to learn how to get better at software services. In some ways, I'd say the software services are more of a stretch for Apple than a car, which seems perfectly aligned with their strengths in industrial design, engineering, and manufacturing. Where do you see the numbers going down? I think you are confusing growth with volume. Does that look like going down to anyone? The problem I have is that Apple essentially just caved to the Chinese Government and invested in the Chinese over the American tech sector. To be fair - you have no idea of Apple's reasoning behind the deal.. Or what did or didn't happen behind the scenes. So your assertion of Apple "caving in" to Chinese government is completely baseless. Asking what would or wouldn't have happened had Jobs been alive is completely pointless, since no one can possibly answer that. Not only it is pointless, but it's also irrelevant. The reality of it is that Jobs has been dead for several years, and Tim Cook is in charge of Apple. All this armchair quarterbacking in the Internet forums about what Tim could have done differently.. or what Jobs would have done instead is a bunch of hogwash. Fact of the matter is - Tim Cook is in charge of Apple, and he does what he thinks is best for the company. It is beyond debate that Apple has been one of (if not "the") most profitable and admired companies in history.. Both before Jobs death and after, under Tim Cook's leadership. Once that changes and Apple's board and shareholders decide to replace Tim Cook - perhaps then you can apply for the role of Apple's next CEO, and then we will see if you do better. I had every faith that if Steve Jobs wanted to pursue a car - he probably would succeed. He probably would also have known when to throw in the towel if Apple didn't produce something extraordinary. Do I feel the same way about Ive and Cook? No. However, do I feel the same way about Musk? Yes. I think Tesla has out-Apple'd Apple - Tesla seems to 'get it' when it comes to the kind of playbook that Apple used to have. Today's Apple thinks that thinner + rose gold = innovation. They really have lost it. Even if the Project Titan comes to fruition, they have a minimum of three years before showing us that they can innovate. In the meantime, their 'A' talent will not be focused on their core products. Worse than "Apple is doomed", will be "Apple is irrelevant". Nothing worse. I think Ive has checked out, and Cook is getting desperate. They can sink all the money they want into Spaceship Campus, and Project Titan. It will be the equivalent of the saying, "Nero fiddling while Rome burned." The difference being the market was pushing Apple to release a phone for years before they finally did, which is partially why the ROKR was such a loathed product. Is anyone besides the diehard Apple fanboi faithful that would buy anything with an Apple logo on it asking for an Apple Car right now? They have no background whatsoever in this market, no experience, no expertise, no history. At least with the iPhone, Apple had two decades of consumer electronics capped by a wildly successful iPod line under it's belt before it dipped its toes in the mobile phone waters. This is more like Boeing announcing it's going to release a line of laptops. Here's an idea: release a substantial MBP and Mac Pro update. Release an update to the rMB with a SECOND USB-C port (and Thunderbolt 3 if we're being honest) Retire or substantially discount the Air line and position it as the new entry level device for students, replacing the years-old non-retina MB. Release an OLED iPhone starting at 32GB and give up this 16GB nonsense once and for all. Release SOMETHING that gets people excited again about Apple products for god's sake, and watch that stock price and those sales numbers rebound.